City reputation rankings (or place rankings in general) aren’t everyone’s cup of tea – as we learned from our interviews with place branding researchers, advisors and practitioners. Still, it is hard to avoid being attracted by the simplicity of those rankings. Perhaps because as competitive human beings we are used to compare ourselves with peers. Every year, the Reputation Institute, a global consultancy well known for its research on the reputation of organisations and corporate brands, takes pulse regarding people’s perceptions of major cities. Perceptions which it then summarizes and presents as the City RepTrak Report – the latest version just published. 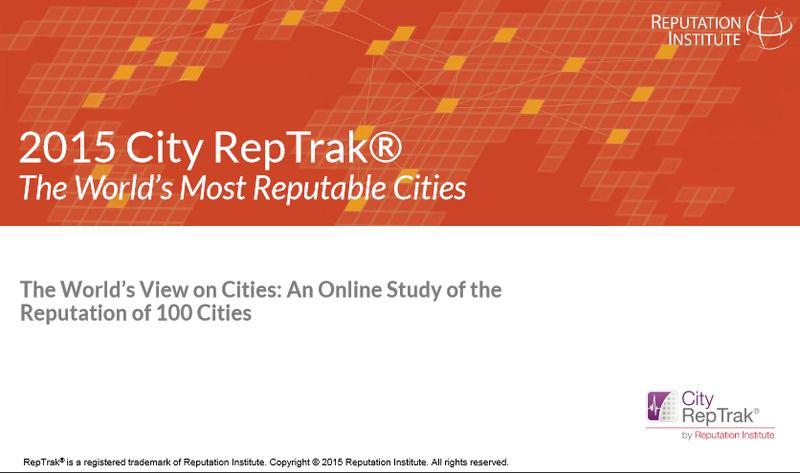 In the following short interview, Reputation Institute’s Managing Partner for Spain and Latin America – Fernando Prado – tells us which findings of this yar’s City RepTrak Report he found the most remarkable, including some thoughts on city perception and reputation trends. Fernando, you just published this year’s city reputation ranking. Which finding surprised you the most? For the first time we have two cities – Sydney and Melbourne – from the same country – Australia – taking first and second place in our ranking. Australia has been represented in the top five of our previous Country Rep Trak® reports, but only with one city at a time. The rest of the 2015 top ten are Stockholm, Vienna (#1 in 2014), Vancouver (#1 in 2012), Barcelona, Edinburgh, Geneva, Copenhagen and Venice. All of the cities in the top ten of our ranking obtain high scores on all of the three dimensions. 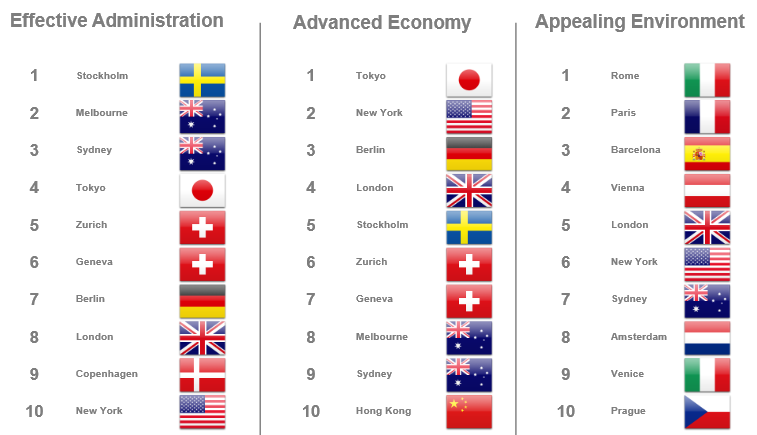 Stockholm, Melbourne and Sydney lead on “Effective Administration”; Tokyo, New York and Berlin are ahead on “Advanced Economy”; and finally Rome, Paris and Barcelona take the lead on “Appealing Environment”. A key conclusion in the report is that the reputation of a city is very dependent on the reputation of its country. We can see increases and decreases in the city reputation index that match very well with what we saw some months ago when we analysed the reputation of the countries where those cities belong. To be large or economically strong does not necessarily mean to have a good reputation. When we compare our reputation list with those of the largest cities by population or GDP we see very few or no overlaps. However, when we compare our list to those of the most liveable cities, the most beautiful cities, or the safest places, we can find the same places on the top, and that gives us an idea of what makes a city reputable. If we look solely at the results of our study, the three most important attributes to build a city’s reputation are: be 1) a beautiful and 2) a safe place, and 3) offer a wide array of appealing experiences. However, it is also important to be well-known in order to make the good reputation have a more important effect on the economic indicators. That is the case with the most well-known cities: Paris and London, which happen to also have a very strong reputation. We can say that a lot of people know them and also admire them. The Australian cities may have a higher reputation score, but the issue is that the familiarity rate is still quite low. Not a lot of people know them, but those who do have a very high opinion of them. Comparing this year’s results with editions of previous years – do you observe any significant trends or changes? In my opinion the most important trend this study (together with our Country RepTrak® study) is showing is the high correlation between the reputation of a place and supportive behaviors such as: I would visit the place, I would invest in the place, I would study in the place, or I would attend an event in the place. Those supportive behaviors are also linked to economic indicators such as tourist arrivals, foreign direct investment or exports. How do you measure people’s perceptions of cities? Reputation is an emotional bond, composed of admiration and respect, trust, esteem and good feeling, which drives people’s behaviors. That emotional bond is what we measure as the main indicator of our study, and the score obtained on such an emotional variable is what places a city in a higher or lower position in our ranking. However, we would not be able to make any recommendation on how to improve a city’s reputation if we only had that overall score. That is why we explain that indicator with a set of 13 rational attributes that we have grouped in three dimensions: “Effective Administration”, “Advanced Economy” and “Appealing Environment”. We measure the perceptions of general population on each of those variables for each city. Why do we need the City RepTrak ranking, in addition to Anholt-GfK Roper City Brands Index, the Saffron European City Brand Barometer, Cities of the Future (fDi Magazine), EUI’s Global Liveability Index, Mercer’s and Monocle’s Quality of Living Ranking, and PwC’s Cities of Opportunity? Country RepTrak® and City RepTrak® have brought a new way of approaching the place branding measurement. We are applying the leading reputation metrics used on the business environment to the place branding arena. The main differentiating factor of the City RepTrak and Country RepTrak rankings is that they are a predictive model which brings not only data on perceptions about a country or a city, but a set of drivers that can be prioritized by their importance when developing action plans. Enjoyed our interview with Fernando Prado on latest city reputation research insights? Share and spread the word!